Why a mobile site is essential for a hotel? Latest news! Internet sites that are not mobile-friendly will get a lower ranking in Google search. 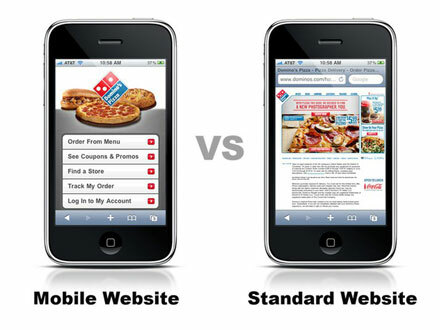 With mobile exploding, you have to pay attention to mobile traffic and your site performance on mobile phones. Mobile phones will overtake PCs as the most common web access device worldwide by the end of 2014. About 40% of the people who have a mobile phone use it for going online, and half of them will go online at least once every day. This presents a huge opportunity for a hotel. According to Oneglobe Network research, around 30 % of visitors access the site from a mobile (iPhone) or a Tablet (iPad). The research was based on data from Google Analytics for main clients' accounts, mostly 4* and 5* independents hotels. 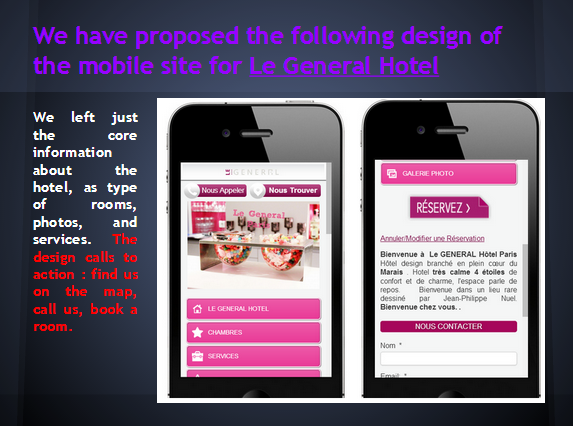 For example in case of Le General hotel in Paris, out of around 3500 visits a month, 730 visits come from mobile devices. If a hotel's site is not mobilized and / or online booking engine is not mobile-friendly, a hotel is losing potential online reservations. Design for touchscreen users: enlarge interface elements to accommodate the "fat finger" problem. Take advantage of inbuilt functionality and call to action, calls directly, maps, QR codes. According to MillWardBrown survey results, speed and display constitute the top criteria for what makes a good mobile website. The results are based on responses from more than 6,000 interviews across 18 different countries. Nearly two-thirds (64 %) of survey respondents indicated site load time was the most important aspect of a mobile site. Clear display on the mobile device (53 %) and the site’s accessibility via mobile search (47%) were also cited as important factors. 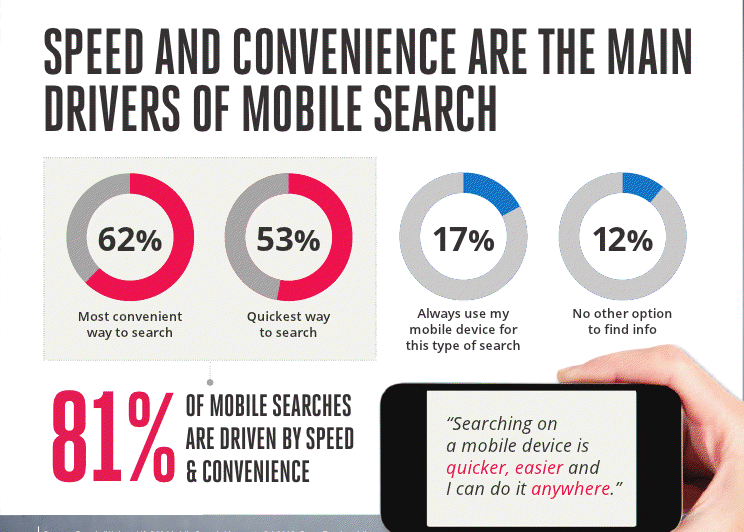 Results show mobile’s advantages over regular desktop sites. In fact, 32 % of respondents desire mobile sites that are easier to use than desktop sites. Other factors that make a mobile site superior to desktop include offering different features (25%), visual appeal (24%), and location-based features (23%). Just as mobile web users are different, most mobile-specific search engines (such as Google Mobile) are also built in different ways. 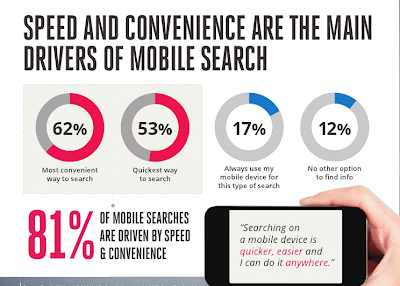 Mobile SEO exists on a different plain to desktop SEO. Sure, keywords are critical - search engines will always operate on the stuff that's fed into them - but other, newer dimensions such as location, device types and content formats are more critical to and indicative of the mobile web experience, and search engines are beginning to figuring out how best to harness them. 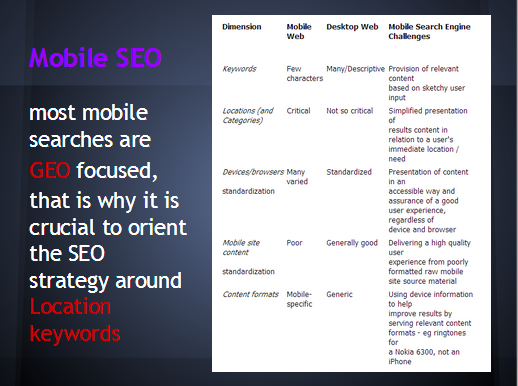 The table on the next slide illustrates some of these differences most mobile searches are GEO focused, that is why it is crucial to orient the SEO strategy around Location keywords. You are probably increasingly hearing that SEO and social media go hand in hand together, which may have not been the case in the past. However the key for your business is to target people where they are and not just publish randomly. Having great content, which attracts they eye, which is easily shareable, which interconnects with your other platforms is part of the secret. Projeqt* is a great tool which may be just what you are looking for. The presentation below illustrates how you can use this platform to publish, create a buzz, and get people talking about your business. View an example of a projeqt embeded in a blog by clicking here! "Optimize for mobile or you will be left out by Google"... here is what was claimed in the conversation between Danny Sullivan (founding editor of Search Engine Land) and Matt Cutts (the head of Google's Webspam team) at SMX Advanced. Get the full story here. This assertion replies to the question "My hotel (or whatever the business) already has a Mobile Application, shall I invest in a Mobile-Optimized Website?" Since recently, Google indeed seems to index Mobile-Optimized Websites better than Standard-Optimized Websites on both Google Search and Maps results. The analysis was carried out on Safari from both a laptop and a mobile phone. On the laptop, the search results were obtained while disconnected from all Google accounts, so as not to influence the results through personalized search. Among the Google Maps results, 9 hotels out of 10 had a Mobile-Optimized Website. On the mobile phone, the results were obtained while connected on Google accounts, personalized search was therefore activated. The result is that we got a hotel website displayed as a personalized result. And the latter was Mobile-Optimized. So, among all the parisian hotels' websites visited in the past, the one displayed by Google is a Mobile-Optimized Website. The other results displayed were third-party sites. As a result, it can be assumed that Google Maps seems to strongly favor Mobile-Optimized Websites. This is an important fact that independent hotels should consider, insofar as Google Maps is the only chance for them to compete (in terms of online visibility) with third-party sites. The Buzzness Conference, which was held in Paris on June 18, 2013 concentrated on the world of mobile. Issues on the best mobile practises in marketing, technology, and sales were discussed. New problems and questions were also raised such as the confidentiality of company information and data when employees walk away with their smartphones.